Fingerprint sensor technologies can be segmented into two main categories: capacitive and optical. Historically, capacitive fingerprint sensors have been more dominant, particularly in mobile phones, and usually take the form of a home button on the front screen or a button on the back of the phone. Such capacitive sensors are rigid and are made of silicon. Optical sensors, on the other hand, aren’t typically used in mobile phones as they require complex and bulky optics which makes their integration into thin, compact devices more difficult. They are more common in border control units which allow for a more bulky construction. Due to the improved signal-to-noise ratio in optical fingerprint sensors compared with capacitive sensors there has been a wealth of innovation aiming to solve the challenges with their integration into products. There are two key technical challenges that have been the focus of the industry for the past few years: 1) making the optical fingerprint sensor module compact, thin and easy to integrate and 2) the ability to place it under displays (for example in smartphones) in order to enhance the user experience. Initially these challenges were being solved using conventional CMOS optical fingerprint sensors. Now new technologies have emerged which allow an optical fingerprint sensor to be made using thin film transistors (using a manufacturing process similar to that used for displays). The advantage of such technologies is the ability to realise large area sensors that can be similar in size to the display without the significant increase in cost as is the case with CMOS-based sensors. As the ecosystem for the Internet of Things expands, devices within the ecosystem will be required not only to securely authenticate their users, but also to have attractive designs. A lot of consumer electronics today feature curved and non-rectangular surfaces which are considered more natural and appealing. 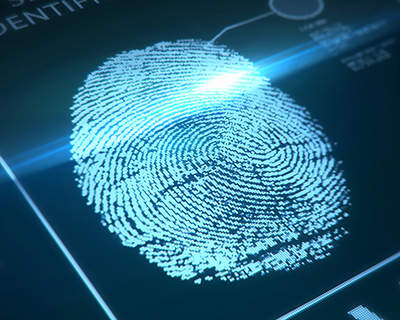 This creates the need for biometric modules that can conform to and wrap around surfaces, and that are thin enough in order not to significantly increase the device thickness. Flexible sensors make this possible. As flexibility, thinness and the ability to scale to large areas cost-effectively become key requirements, the thin film transistor technologies that are suitable for optical fingerprint sensors become limited. One such technology is organic thin film transistors (OTFT) on plastic. By combining OTFT with organic photodiodes (OPD) an organic optical sensor is made that can be used for fingerprint imaging. The thickness of such a sensor is only 300 microns today and can be reduced to 175 microns by using a thinner plastic substrate. Such a thin flexible sensor can bend around a car steering wheel, can be curved around the edge of a phone or tablet or can be placed under an OLED display in any application by using the right optical stack between the sensor and the display without significantly adding thickness to the full module. The key innovation then becomes the development of the compact optical stack that maintains the signal-to-noise ratio of the sensor and enables seamless integration into the end product. This is usually a pin hole matrix structure that is engineered with the display and cover-glass thickness in mind as well as the transparency of the OLED display and the light generated for use by the sensor. The end goal is a display-enabled device that can authenticate its users seamlessly and enhance their user experience.